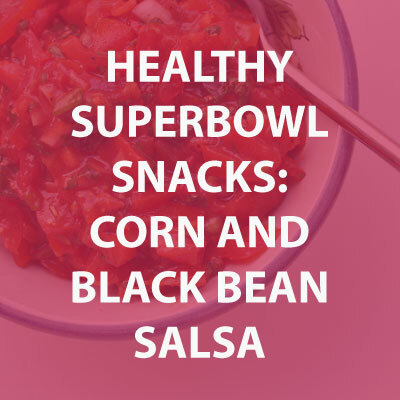 Next up in our series of healthy Superbowl party dishes is our recipe for Black Bean and Corn Salsa. Not only is this recipe delicious, it’s easy to make – no kitchen appliances needed. Make it fresh right before your guests come or let it sit in the f ridge for an hour so it can absorb its flavors. Black Bean and Corn Salsa (Adapted from AllRecipes.com). Next, peel and dice your avocado. For tips on how to peel an avocado, check out our previous blog post. Rinse all of your beans and corn in a strainer under water. Add them to the mixture. Finally, lightly stir in your lime juice. Be sure not to crush your avocado chunks. When ready to serve, add the olive oil and stir gently. Serve with baked tortilla tips or pita bread. The Superbowl is this weekend, and besides debating who will win, you may also be wondering what to make for your Superbowl Watch Party. 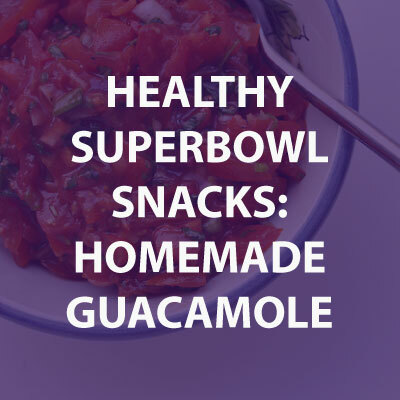 This week, we have just the thing: a series of recipes that are perfect, healthy snacks to have on hand for the big game. First up, we recommend making a guacamole dip. It’s an easy recipe to make that also packs a lot of nutrients. The Mayo Clinic says avocados are both high in monounsaturated fat and a good source of lutein, which is an antioxidant that may protect vision. We also like this recipe because it’s easy to make: no fancy kitchen appliances needed. Just have a spoon, knife and bowl on hand. Guacamole Dip (Adapted from AllRecipes.com). 3 avocados – peeled, pitted, and mashed. Start by peeling your avocado. Want an easy way to peel it? Slice it in half around the pit. Then, pull the avocado apart to reveal the pit inside. With your chopping knife, cut into the pit and twist the knife. The pit should pop right out onto the knife. Then, instead of peeling the avocado, make your slices directly into the avocado halves. Slice both horizontally and vertically. When done slicing, flip the skin inside out and scoop out the diced avocado chunks into your bowl. Repeat for your other half. Mash up your avocado to a consistency you want. Some people like their guac a little more chunky while others like it creamier. Dice your tomato and onion. Mix these into the avocado paste. Cut your lime in half and squeeze both halves over the bowl. Chop your garlic into small pieces and mix into the bowl. Chop your cilantro and evenly to the mixture. Add your pinch of cilantro and mix in. Once you’re done, you can either refrigerate the guac for an hour or serve it immediately. You may notice that guacamole turns brown in a relatively short time. While adding the lime juice and mixing the guac can help, be sure not to leave it out too long and eat it within a day or so.